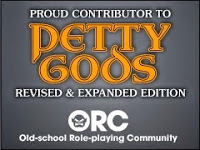 This morning I thought I'd be brave and blindly purchase something off of the "Personalized Suggestions" list from DriveThruRPG, or at least something that wasn't one of my own items (DTRPG somehow thinks I want to purchase items I produced)! This one particular item, Classes of Ruin, has been pretty steady on my list for a couple of months now. It is PWYW so I tossed a buck their way and picked it up for review. Normally I wouldn't have picked this up because the product page is full of red flags for me. First is the fact that the only preview available is the picture of this Yeti. The only product description given is "A collection of Ruin character classs [sic] for use with Labyrinth Lord." There are four "character classes" in this download. Each class has two files, a MS Word document and a PDF. It looks like LibreOffice 5.0 was used to write these up and in my experience LibreOffice is a sub-par way of making either Word of PDF files. It takes a bit of a work-around to open the files, but nothing too strenuous. 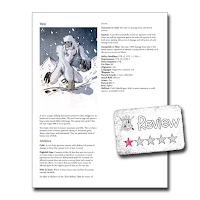 Games, Inc.; author Scott Greene, based on original material by Gary Gygax. There are no Giant Rhinoceros Beetles in this download, outside of the overly long OGL. The product page lists that these classes are for use with Labyrinth Lord, but Labyrinth Lord isn't mention once in these OGLs. OK, that might be a bit of an assumption since I didn't check all four pages of superfluous OGL content listings. There are also numerous spelling errors that would have easily been picked up with a simple spell-check. Now when it comes to the classes, the actual "meat" of this download......yeah, these are not appropriate character classes. Way too overpowered to be appropriate, I'm not even sure they would be suitable for NPC use. The 1st one, the Ghost, starts out with 14 d8 hit dice! The abilities at 1st level are campaign-wreckers for certain. While this one "class" is probably the most OP right out the gate, the Loremaster will probably beat it after a few levels. The other two, the Kappa and the Yeti, aren't anything too special. I just don't see their merit. Another thing I noticed is that the art style for each piece differs greatly...enough I doubt they were from the same artist. Unless it is buried in the OGL I didn't see any artist information. This is too bad because in some cases the art is the best thing about these character classes. Overall, Classes of Ruin is not something I'd recommend. Damn you DTRPG for dangling this in front of my face for a couple of months!